WHO: College juniors and seniors, recent college graduates and graduate students. We’ll also consider some really exceptional college sophomores. WHAT: The Campaign Academy is a six-week comprehensive training in the workings of campaigns. We spend all day, every day covering key campaigning topics, from canvassing to getting out the vote. By the end of the Campaign Academy, students will be able to create and execute a campaign plan. WHEN: May 28 to July 6, 2018. Monday through Friday from 10:00am to 5:00pm. HOW: Apply here. 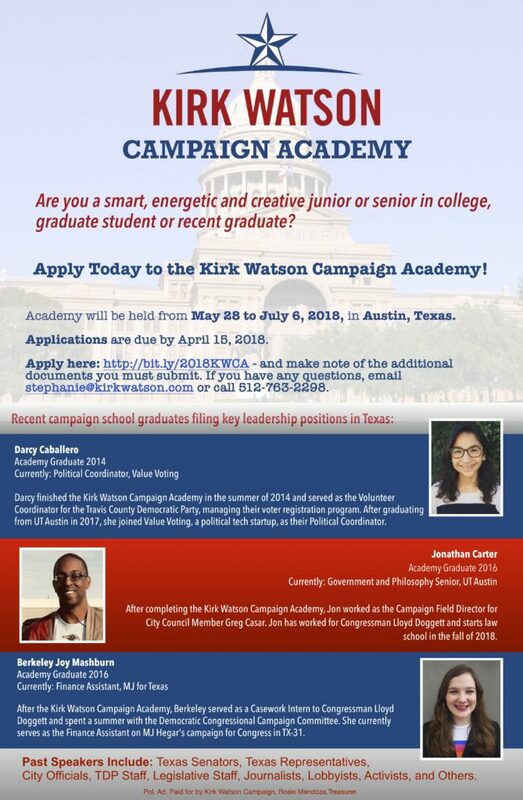 Check here for more information or contact Stephanie Chiarello Noppenberg, the executive director of the Campaign Academy, at Stephanie@kirkwatson.com. Applications are due by April 15, 2018 at 5:00pm CST.